SINGAPORE - There has been a deluge of the king of fruits in Singapore, with the number of durians imported in the first half of the year already exceeding the halfway mark for last year. Durian sellers and buyers also said that unlike previous years, the prices have fallen. The reason for the bumper crop? Good weather in Malaysia, said sellers. According to the latest figures from the Agri-Food and Veterinary Authority of Singapore (AVA), 8,900 tonnes of fresh and chilled durians were imported into Singapore, more than the amount recorded at the halfway point last year when a total of 14,300 tonnes were imported for the whole of 2017. 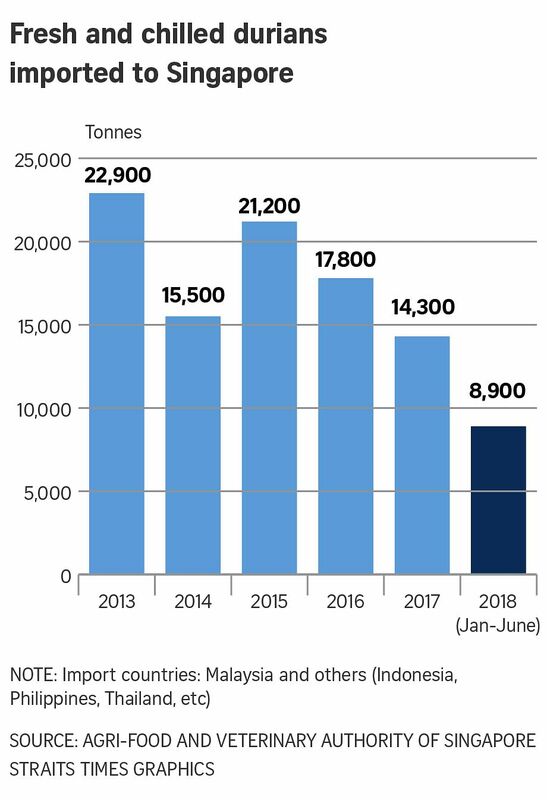 Of the number of durians imported so far this year, 8,300 tonnes came from Malaysia and 600 tonnes from Indonesia, the Philippines, Thailand and other countries. According to Shin Min Daily News, 8,900 tonnes of durian is equivalent to about 6 million durians, if one fruit weighs 1.5kg. This year, not only is there an abundance of the fruit but the quality of the durians is also better, said durian lovers. Mr Alvin Teoh, 33, owner of Durian36 in Geylang Road, said he imported 60 to 70 per cent more this year than the first half of last year. He said he sells the highest grade of mao shan wang durian - also known as musang king - for as low as $15 per kg during this season. Last year, the price for the same grade was $22 to $25 per kg. He said: "Mao shan wang comes in different grades - A, B and C. The grade of durian I sell, grade A, weighs about 1.5kg and has more flesh and flavour than the rest." Mr Johnny Chua, 66, a durian seller at Sembawang Durian Seng, said in Mandarin that business has been good thanks to the cheaper and more abundant supply of durians this year. He said he has sold more than 500kg of the fruit so far. Frequent durian buyer Ang, a public servant who declined to give his full name, said that while the quality of durians can be subjective, there are ways to evaluate the fruit, for instance, in its consistency and creaminess, the intensity of the taste, and overall ripeness. Mr Ang, 32, who said he has carried out his own research on how to choose good-tasting durians, said: "For durians, as with most crops, better yield and quality go hand in hand. "Under conditions like hotter and drier weather, the durian trees tend to produce more abundant fruit, and the average quality also improves. "This is a good time to buy durians as they are also cheaper," he added. This year's crop is still not as big as the number of durians imported into Singapore in 2013, when a record 22,900 tonnes were brought into the country, according to the AVA. So how long will this durian feast last? Mr Teoh said: "I think Singaporeans can get to enjoy the increase in durian imports for about two more weeks."